In a concept piece called Preoxygenation. Reoxygenation and Delayed Sequence Intubation in the Emergency Department, I outlined a concept which I called: the vent as a bag. Why would we use the unpredictable and unmeasured BVM, when instead we could use a purpose-built, strictly internally regulated machine like a ventilator. I had stopped talking about the idea when numerous people told me it was unfeasible in their environment–however, I continued this practice for my own patients throughout my practice. Recently, Grant et al. published a case series using the same concept–they have dubbed their vision of it VAPOX. Scott Weingart. EMCrit Podcast 172c – Vent as Bag & VAPOX. EMCrit Blog. Published on April 17, 2016. Accessed on April 22nd 2019. 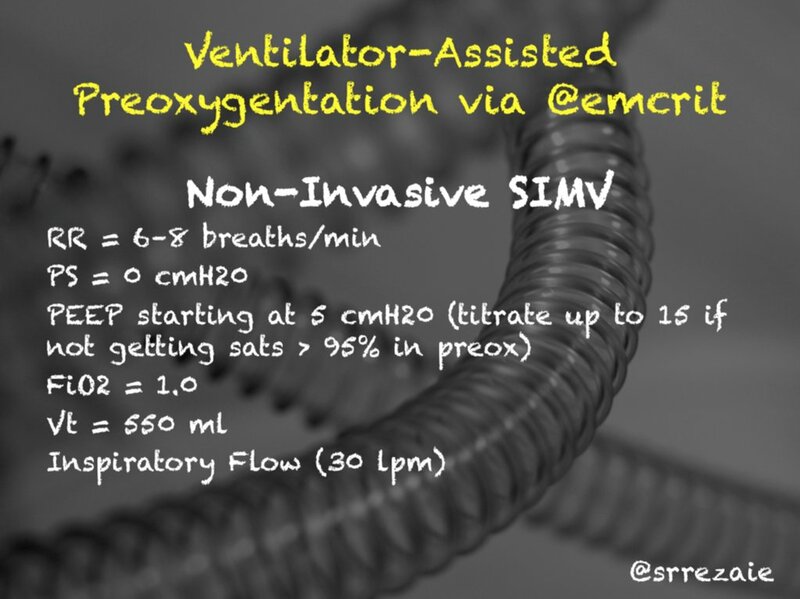 Available at [https://emcrit.org/emcrit/emcrit-wee-vapox/ ]. This Post was by the EMCrit Crew, published 3 years ago. We never spam; we hate spammers! Spammers probably work for the Joint Commission. In anesthesia, occasionally when performing MAC cases we may give our patients a little bit too much propofol, requiring either assisted ventilation or increasing our FiO2 via NC/FM. One thing I do and have seen done by many, is place a Nasal Trumpet (lubed with lidocaine jelly), then take the end off of a 7.0 ETT, attaching it to the trumpet, This can then be connected to the circuit and patient placed on the vent at settings similar to those in the VAPOX protocol. When doing anesthesia in a remote setting without a vent, it easily attaches to a BVM. I personally, feel this may be a little more tolerable than a mask, plus it aids in maintaining a patent airway in the patient that may obstruct. Additionally, if intubation is needed, you can continue to provide apneic oxygenation. I have seen this as well and even the dual nasal trumpet connectors. A very workable solution. Too difficult? Too complex? Really? No. It’s just laziness. Learn the vent, learn from an RT, get equipment staged in the ED…. Do what you have to do to be good to the patient. Using the vent as a bag is safe, and smart. It also frees up cognitive loading as you don’t need to constantly worry about the BVM being perfectly done. Why AC over SIMV? In DSI SIMV would be preferred no? Bravo! This techniques extends to the prehospital environment as well. Lee County Department of Public Safety/EMS has dramatically reduced dependency on bag-mask ventilation in favor of using a SIMV transport ventilator for most, if not all, conditions that require ventilation. For all the patient safety reasons that you have identified, this paradigm shift has proved to be very successful in reducing provider variability. I’m curious, for this particular use, would pressure control be a preferable mode to avoid opening of the lower esophageal sphincter? You could set P_h to 20cmH2O for example, as I worry with a more leaky system you might reach higher peak pressures with a volume control mode as the vent attempts to deliver the set volume. I suppose using 30L/m flow rate is to help minimize that effect. As you said, the primary goal is oxygenation in this patient, which is well accomplished with PC as well. Also, are you suggesting this can be a hands free operation once the mask is strapped? When I’ve ventilated patients in the OR after pushing the paralytic, I almost always had to apply a jaw thrust or chin tilt to open the airway or utilize an OPA. If they are in the Fowler’s position (with gravity to help), or are not paralyzed then I can see this being truly hands free. I will see if I can convince my attending to let me try this technique for my next intubation as my nursing staff looks on in bewilderment. you still need the manual jaw thrust after you push the meds. straps only keep you from having to hold during 3 minute preox. PC works fine as well. HI I am a ED registrar working in perth. Just listened to this podcast today. I liked the idea of using the vent to pre oxygenate but two questions came to mind. 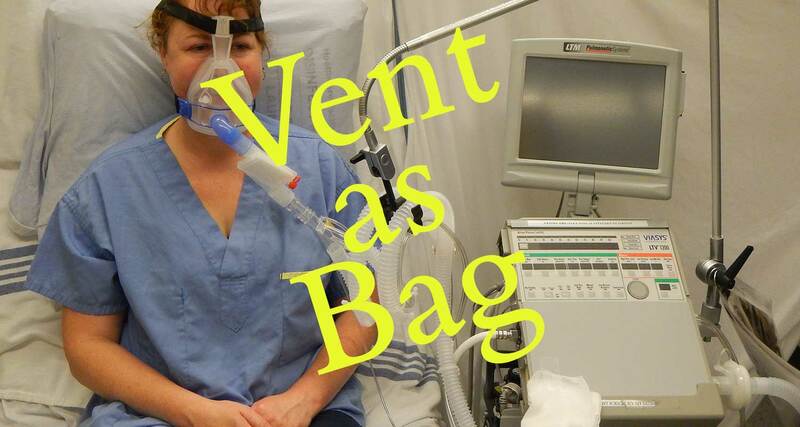 First of all am presuming that you can deliver higher FIO2 using the vent instead of a bag mask? Also usually we do not bag while the patient is apneic, so if you had a your vent set to 8 bpm then during the apneic period you will still be delivering breaths. Does that not incerase your risk of gastric insufflation and thereby incease vomitting? I love this paper and this concept. To address a certain patient scenario- if you had a super tachypenic patient with salicylate OD or DKA would you alter the rate on the vent to something above 6-8 breaths per minute during the apneic period in order to maintain that respiratory compensation? Do you think there would be any benefit to doing this and would it be safe? Gotcha- sorry I forgot that you had talked about that already way back in episode 3. Looking forward to incorporating this into my practice. yep-not a limitation I have. If you use VAPOX with breaths during apnea, no gain or need for apneic ox or NC for preox. Would strongly recommend you get some mask straps–makes the preox much easier. Billy Lifeguard 1 flight nurse. I also worry about risk for vomiting during the apox period. Could you educate me more about this. I really appreciate your podcast btw. It is used in large part as our training source with our Helicopter EMS service! It has changed how I think about medicine and airway management. Keep up the good work! RTs are the best to provide this type of airway management and they are the ones who know how to bag a patient correctly – with proper rate, peep, VT, etc. Thanks so much for sharing your opinion on this matter. A concern is that the Oxylog 3000plus has alarms off in NIV – compensates well for leak but no alarms. The paper in JEMAustralasia used Hamilton ventilators which may be different. Would waveform capnography be enough, to add to alertness, to stay safe with this technique? if that is true of the oxylog, I would keep it in invasive mode throughout preox and apox. i wind up doing this in pretty much any vent. the leak tolerance feature is not worth that much.